There seem to be a lot of ways to write about your R package, and rather than have to decide on what to focus on I thought I’d write a little bit about everything. To begin with I thought it best to describe what problem rdhs tries to solve, why it was developed and how I came to be involved in this project. I then give a brief overview of what the package can do, before continuing to describe how writing my first proper package and the rOpenSci review process was. Lastly I wanted to share a couple of things that I learnt along the way. These are not very clever or difficult things, but rather things that were difficult to Google, which now I think about it should probably be the best metric for a difficult problem. The Demographic and Health Survey (DHS) Program has collected and disseminated population survey data from over 90 countries for over 30 years. This amounts to over 400 surveys that give representative data on health indicators, which in many countries provides the key data that mark progress towards targets such as the Sustainable Development Goals (SDGs). 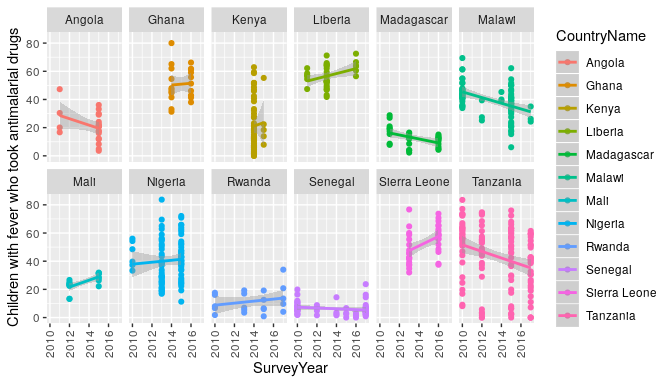 In addition, DHS survey data has been used to inform health policy such as detailing trends in child mortality1 and characterising the distribution of malaria control interventions in Africa in order to map the burden of malaria2. This is all to the say that the DHS provides really useful data. However, although standard health indicators are routinely published in the survey final reports that are published by the DHS program, much of the value of the DHS data is derived from the ability to download and analyse the raw datasets for subgroup analysis, pooled multi-country analysis, and extended research studies. This where I got involved, in trying to create a tool that helped enable researchers to quickly gain access to the raw data sets. I am fortunate enough to be a PhD student in a really large department at Imperial College London, which means that I get the opportunity to be involved in many projects that are outside the scope of my actual PhD. The “downside” of that is sometimes you get given “code monkey” jobs as the bottom rung of the monkey ladder. And so, a few months into my PhD (Nov 2016), I was given the job of downloading data on malaria test results from the DHS program that was going to be used by some collaborators. At the time I was very happy to be involved, however, I was apprehensive to spend too long on the job as I didn’t know how much time to be spending on side projects vs my PhD (something I still don’t know with 6 months to go). This combined with only having a year or so’s experience writing R meant that the code I wrote to do the job was a bunch of scrappy scripts that required manually downloading the datasets before parsing them with these R scripts. Dirty but it got the job done. Some time passed, and another collaborator wanted some different data collated from the DHS program. At this point, I had 6 more months familiarity with R and knew a bit more so I started writing it as an R package. However, it was still messy and it required manually downloading the datasets first, but I was happy with it and again it wasn’t a major project of mine. This would have been probably where the project ended if I hadn’t had a conversation (Sept 2017) in the tea room (prompted solely by the presence of free biscuits) with the other main author of rdhs, Jeff Eaton. We got chatting, and realised we both had a bunch of scripts for doing bits of the analysis pipeline. We also realised that we had both had numerous requests for data sets from the DHS program at which point we thought it would be best to do something properly. I had also at this point been keen to start using testhat within my work as I had been told it would save me time in the future, and up till that point I hadn’t found a good case to get to grips with it (mainly writing code on my own, that was never very big and was only used by myself). And so we started writing rdhs, which was accepted by rOpenSci and CRAN in December 2018. Disclaimer: The following section (the API and Dataset Downloads headings) is an overiew of the Introduction Vignette. If you want a longer introduction to the package then head there, otherwise carry on and eventually you will get to my ramblings about the package development process. Accessing standard survey indicators through the DHS API. Using the API to identifying the surveys and datasets relevant to your particular analysis, i.e. the ones that ask questions related to your topic of interest. Downloading survey datasets from the DHS website. Loading the datasets and associated metadata into R.
Extracting variables and combining datasets for pooled multi-survey analyses. The DHS program has published an API that gives access to 12 different data sets. Each API endpoint represents one of the 12 data sets (e.g. https://api.dhsprogram.com/rest/dhs/tags), and can be accessed using the dhs_<>() functions. For more information about this see the DHS API website. One of those functions, dhs_data(), interacts with the the published set of standard health indicator data calculated by the DHS. For example, to find out the trends in antimalarial use in Africa, and see if perhaps antimalarial prescription has decreased after rapid diagnostic tests were introduced (assumed 2010). Let’s say we want to get all DHS survey data from the Democratic Republic of Congo and Tanzania in the last 5 years (since 2013), which covers the use of rapid diagnostic tests for malaria (“RDT” below). To begin we’ll interact with the DHS API to identify our datasets. ##  $ FileFormat          : chr  "Flat ASCII data (.dat)" "Flat ASCII data (.dat)"
##  $ DatasetType         : chr  "Survey Datasets" "Survey Datasets"
##  $ SurveyId            : chr  "CD2013DHS" "TZ2015DHS"
##  $ FileType            : chr  "Household Member Recode" "Household Member Recode"
##  $ FileDateLastModified: chr  "September, 19 2016 09:58:23" "August, 07 2018 17:36:25"
##  $ SurveyYearLabel     : chr  "2013-14" "2015-16"
##  $ SurveyType          : chr  "DHS" "DHS"
##  $ DHS_CountryCode     : chr  "CD" "TZ"
##  $ FileName            : chr  "CDPR61FL.ZIP" "TZPR7AFL.ZIP"
##  $ CountryName         : chr  "Congo Democratic Republic" "Tanzania"
To be able to download survey datasets from the DHS website, we need to set up an account through the DHS website to enable you to request access to the datasets. Instructions on how to do this can be found here. Once we have created an account, we set up our credentials using the function set_rdhs_config(). See the Introduction Vignette for more clarity about the various options for setting up your config. The dataset returned here contains all the survey questions within the dataset. The dataset is by default stored as a labelled class from the haven package. To extract our data we pass our questions object to the function extract_dhs, which will create a list with each dataset and its extracted data as a data.frame. ## Warning in rbind_labelled(extract): Some variables have non-matching value labels: hv024. For more information about controlling how to extract data from your downloaded sections, see the last section in the introduction vignette. Which malaria RDTs are performing worse in low malaria prevalence regoions? What is the link between HIV prevalence and wealth? How far apart should births occur to minmise childhood mortality? Clichéd but the process of actually writing a package, and all that entailed, was a real highlight. I had made R packages before, but I had never done everything that a good R package should have (tests, effective continuous integration, full documentation, a pkgdown website, contribution and code of conduct guides, and so on). One particular highlight for me was actually having the opportunity to work on a code base with someone else in a collaborative way. I work in a large collaborative group, however, this has not translated as much to working on the same set of code with someone. As a result I’ve never had to properly learn how to use git outside of clone, commit and push, nor had I made use of much of the useful aspects of GitHub. So learning how to correctly use branches in git and realising that helpful comments are actually helpful (eventually) was really great. With this in mind I wanted to thank Jeff Eaton again for taking on this project. He definitely helped drive it over the finish line, and it was nice to have a glimpse at what working as a developer would look like if I decide to leave pure academia. The DHS website has a download manager that you can use to select surveys you want to download, and it will auto generate a list of URLs in a text file. When I saw this, I thought this would be great for creating a database of what data sets and the URLs a user’s login details can give them, which can then be cached so that rdhs knows whether you can download a data set or not. The only problem is, that to download those data sets you need to be logged in, and you also need to be logged in to get to the download manager. For me, I didn’t know how to translate being “logged in” into R code, or even what that looked like. But turns out it wasn’t too bad after being shown by Rich where to start looking. To know where to look I opened up Chrome and went to developer tools. From there I opened up the Network Tab, which then records the information being sent to the URL. So to know what information is required to login I simply logged in as normal, and then inspected what appeared in the network tab’s Headers Tab. This then showed me what the needed Request URL was, and what information was being submitted in the Form Data at the bottom of this tab. To me, this seemed really cool, and then meant I could do the same style of steps to get to the Download Manager webpage and then tick all the check boxes in the page to generate the URL with all the download links in. We wanted to be able to cache a user’s API request for them locally when designing rdhs. We felt this was important as it would reduce the burden on the API itself, as well as enable researchers who were without internet (e.g. currently working in the field), the ability to still access previous API requests. However, designing something neat that would be easy to respond to changes in the API version would I thought be outside my skill set. Again, enter Rich and this time with his package storr. This was a lifesaver, and created an easy infrastructure for storing API responses in a key-value store. I could then use the specific API URL as the key and the response as the value. Initially I thought I would have to keep saving the response with explicit names (e.g. the URL), but storr handles all this for you, and also then helps get around having too long file names if your API request is very long for example. To respond to changes in the API, my solution was perhaps not the neatest, but I simply kept a record of the date you last made an API request and compared it to the API’s data updates endpoint. If I could see any recent changes, I then could clear all the API requests cached. This would made a lot simpler using the namespaces options in storr, which meant that I was able to keep all API cached data in one place, which could then be easily deleted on mass. The last thing caused me the most amount of headaches. How do I write tests that require authentication and can use travis for continuous integration. Initially, I made a dummy account with the DHS website for this, but realised that sharing the credentials of an account with access to just dummy data sets would not enable me to test the weird edge cases that started popping up related to certain data sets. The first solution that I used for a few months was to set up environment variables within travis itself, which could then be used to create a valid set of credentials. This worked, however, it meant that I would have to write a lot of the rdhs functionality to use environment variables that were the user’s email and password, which felt wrong and quite clunky. All I wanted was to pass to Travis a valid set of login credentials that would then be used within the tests, much in the same way that a user would. To do this I had to learn a bit more about what the .travis.yml document could actually be used for, because to begin with I had only been using it to specify the software language. This encrypted copy could be included in the GitHub repository, and I could set up the key as a Travis environment variable to decrypt it. This decryption step could then be written within my .travis.yml file, and would mean that all my tests had access to my login credentials in a secure way. There are a few things that would be great to add in the future. Adding a suite of tools for doing spatial mapping. A lot of the time, people want to know what the prevalence of x is either at a fine spatial scale, or grouped at administrative/county/state levels. rdhs helps provide the tools to get geolocated measures of x, and I think it would be a great next step to add a suite of mapping tools. It would be great if they could be used to either create a mesh through these points (probably using INLA), or calculate survey weighted means at requested spatial scales or match them to a provided SpatialPolygons object. Related to this is it would be good to also link in the Spatial Data Repository from the DHS, so that users can easily download shape files for their analyses (issue #71). Not related to any specific issues, but it would be good to have a clearer set of downstream analysis pipelines. One example is a package in development by Jeff Eaton called demogsurv, which is used to calculate common demographic indicators from household survey data, including child mortality, adult mortality, and fertility. This is just one example, but over time there will be a number of bespoke analysis tools down the line, and so it would be nice to begin a collection/grouping of these tools (possibly as a wiki or similar). It would be nice to have a way to manually add sources of survey data. At the moment the pipeline for downloading raw data sets used the DHS API a lot, however, what if you had some survey data (either locally or shared at a URL) that you wanted to bring into your analysis pipeline. Something similar to this is done for the model_datasets within rdhs, which is a set of dummy data sets that the DHS hosts online but are not included in their API. Firstly, I want to thank Anna Krystalli for handling the review, and for being incredibly patient throughout, especially at the end as we were fixing the last authentication bug. Also many thanks to Lucy McGowan and Duncan Gillespie for taking the time to review the package and for their input, which led to lots of improvements (and also linking the add_line function from httr was seriously helpful, and I’ve used that function in lots of other my other work now). I also wanted to more broadly thank the review process as a whole. Having the option to discuss the package and needed solutions with the reviewers within a GitHub issues system is fantastic. It made the process personal and was substantially improved over review processes I have had at academic journals. Lastly, another big thank you Jeff Eaton and Rich FitzJohn, and also to the infectious disease epidemiology department at Imperial for providing a lot of really helpful ginuea pig testing of the numerous iterations of rdhs.